If you don’t have tears running from your eyes from laughing at this, then I pity you for not having a sense of humor. The singer was a musician by the name of Steve Mauldin and apparently, this was just some messing around late at night and never intended for the public. Even so, thank you, Mr. Mauldin for giving us some unintentional Christmas cheer during a time when people are fighting the “war on Christmas”, pushing and shoving each other over a toy, and we get to feeling stabby after our co-workers play “The Christmas Shoes” one too many times. 03 Nov 2010 Comments Off on WTF, You Tube (NSFW)? (Literal Video+Hooked on a Feeling) The Hoff =Epic Win! For more literal videos, which are quite hilarious, check out dascottjr’s channel on You Tube. What do you get when you cross a 60s musical sitcom with one of the worst movies ever made? 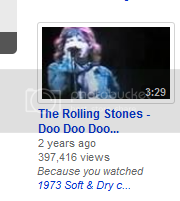 Because I watched a 1973 commercial for Soft & Dri Deoderant featuring a voice over with Casey Kasem, You Tube thinks I should watch a video for The Rolling Stone’s Doo Doo Doo Doo Doo (Heartbreaker). Really, You Tube? What does Mick Jagger have to do with women’s deodorant? What does this song even have to do with deodorant? The lyrics talk about some sad and gritty subjects (drug use being one of them), but I don’t recall pitting out your shirt or people offended by the nasty funk you are emitting from your armpits being one of them. Casey Kasem hosted America’s Top 40 and played quite a few Rolling Stones songs in his day, but Casey Kasem did a lot of other things and I don’t see You Tube recommending I watch a particular episode of Scooby Doo because I watched an old deoderant commercial. Just because two things happened in the same decade doesn’t mean they are even remotely related.